monument of 6-th century. It is still active. VARDZIA - carved into the rock is situated on the left bank of the river Mtkvari. It was a built in 12-th century while the king Tamar ruled the country. It is at 1300 meters up from the sea level. King Tamari’s room, big hall, some wine-vaults and what is most important the ancient frescos still exist. In the deep of the fortress there are natural streams and big tunnel. 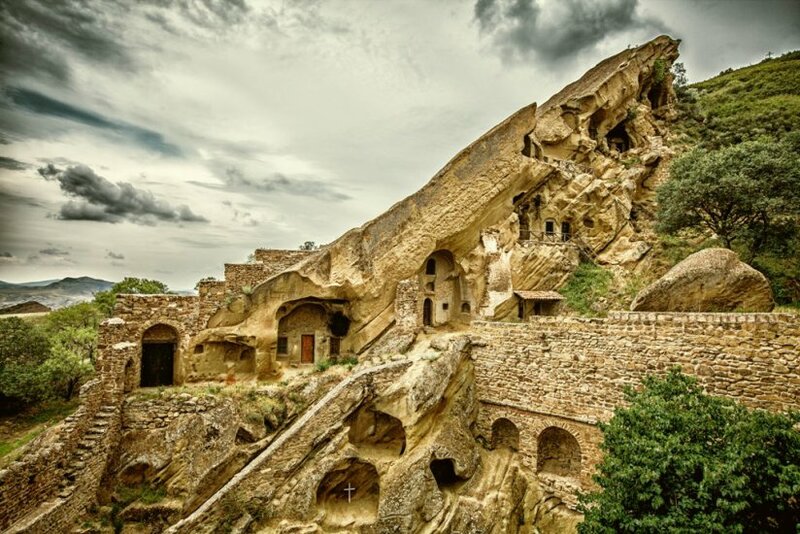 In total, Vardzia contains 3000 caves. Nearby the natural sulfurous warm waters coming out of the ground. 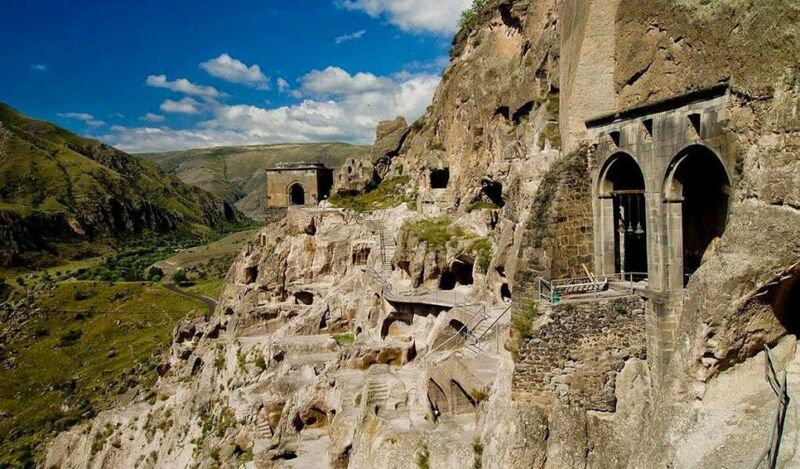 UPLISTSIKHE - (God’s fortress)- according to the historical sources, Uplistsikhe complex carved into the rock was established in 6-4 centuries B.C. The town had militarystrategic instruction. It was one of the biggest road buildings of the basic trade artery in the Caucasus. Day 1: Arrival in Tbilisi, at the International Airport of Tbilisi. Meeting and pick up to the HTL. You will visit “Old Tbilisi” – Metekhi church (13-th century), Narikala fortress (5-th fortress), Sulfurous baths, Synagogue, Mosque, Karvasla, Sioni Cathedral (6-7-th centuries), Mtatsminda (holy mountain)- Mamadaviti’s church (19-th century). The Georgian State Museum and walking on the rustaveli avenue. We start from Tbilisi early in the morning and drive to David Gareja cave complex located in a stark, semi- desert landscape. After seeing Lavra Monastery we walk up for about 50 minutes to Udabno Monastery to enjoy its wonderful painted caves and dramatic views across to Azerbaijan.Kakheti region is east part of Georgia, famous for it's wine growing. In Kakheti, we will overnight in one traditional Georgian family and have a supper and breakfast there (we will have a chance to taste georgian traditional dishes and wine). You will visit Nekresy monastery(4-16 Alexandre Chavchavadze’s museum in Tsinandali, which is famous for its rare plantgrades.. By evening you will take a walk in Telavi. You will visit historical Town-Fortress Signagi; Monastery of saint Nino (4-6 th century) and her grave. The ancient capital of Georgia – Mtskheta and its historic Jvari Monastery(6th century) and Svetitskhoveli Cathedral(11th century) – both UNESCO World Heritage sites. In Gori we visit cave-town Uplistsikhe(6-4th centuries B.C. ), one of the main points along the Great Silk Road, visit Stalin’s museum. You will visit rock-carved city Vardzia (12-th century), the Khertvisi fortress (10-11-th century). You will visit wonderful Borjomi park. Check out, pick up to the airport of Tbilisi. The program can be customized or developed according to the wishes of you and your co travelers.